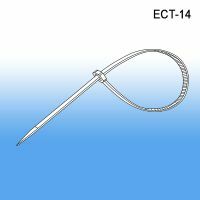 ECT-14 Discontinued! Priced to Sell! Buy Now! While Supplies Last! 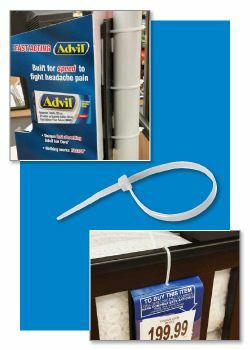 Also known as Zip Ties, Zap Straps, Nylon Ties, etc., this product is used in the Point of Purchase and Retail Industry as a very durable way to secure signage to displays and racks, a Clip Strip® Merchandising Strip to a pole or wire rack display, or to ensure ceiling hanging devices are not in jeopardy of becoming loose. Cables Ties are locking strap fasteners that are also used in township recreation departments or at events to build and secure temporary fencing, in the electrical and contracting industry to bind cables and wires together, and as a security device by police departments as plastic handcuffs or in the military as a criminal restraint or hand cuffs. The uses are endless, even extending to the household. Minimum quantity for "Cable Tie, 4" Long, 18 Pound Rated, ECT-4" is 100. Minimum quantity for "Cable Tie, 8" Long, 40 Pound Rated, ECT-8" is 100. Minimum quantity for "Cable Tie, 11" Long, 50 Pound Rated, ECT-11" is 100. Minimum quantity for "Cable Tie, 14" Long, 50 Pound Rated, ECT-14" is 100. 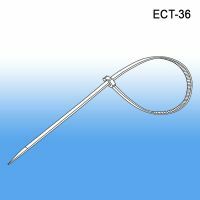 Minimum quantity for "Cable Tie, 36" Long, 175 Pound Rated, ECT-36" is 100. 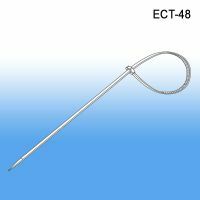 Minimum quantity for "Cable Tie, 48" long, 175 Pound Rated, ECT-48" is 100.